What began in 2013 in Fairfield as a spin off restaurant to Danbury’s Pho Vietnam, Mecha is now a Fairfield County “mini-chain” with locations in Fairfield, South Norwalk and New Haven*. Mecha mixes Restaurateur Tony Pham’s Vietnamese heritage (pho!) with Japanese ramen and other Asian street foods like dumplings and bao. And it does this in happening, relaxed spaces with cool music in the background and super friendly servers who go out of their way to make sure you’re having a good time. We’ve been taking our kids since the early days of the Fairfield only location and we were psyched when they opened their second SoNo location, a good 15 minutes closer to us. I’ve yet to go to the New Haven spot, but my guess is that it’s killing it with the college and grad student populations. (The prices at Mecha are fairly light given the quality). *Annnnd Mecha will soon be opening its FOURTH location right here in Downtown Stamford (Bedford Street) this fall. Woo hoo! 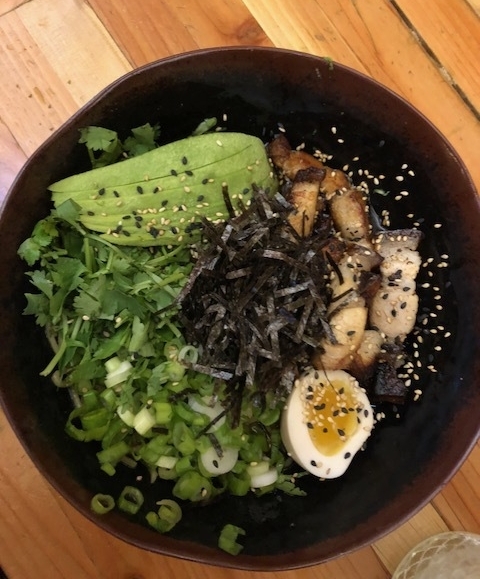 As the name suggests and their “Slurping Encouraged” tagline really brings home, Mecha focuses on bowls of hot ramen and pho. Mecha offers four different versions of Vietnamese pho, each made from the same beef and chicken stock, with rice noodles and all kinds of herbs floating around in the broth. There’s a classic version with rare beef slices (Pho Tai), a version that also adds beef meatballs into the mix (Pho Vien), one that replaces the beef with chicken slices (Pho Ga) and final version that replaces the beef with fermented bean short ribs (Pho King). If you’re more of a ramen person like I am, Mecha also has you covered. Mecha offers four varieties of ramen, but unlike the pho, each ramen starts with a different preparation. I usually get the most traditional Tonkotsu, a pork based ramen with chashu (roasted pork belly), spicy sprouts, egg and scallion. My husband swears by the Spicy Miso, another pork ramen with chashu, but this one adds red miso, mushrooms and chili oil. I’ve tried his in the past and it’s incredibly flavorful - I think I need to get over my fear of it being “too spicy” and order it next time. For those who prefer poultry, Mecha also offers the Shoyu Paitan (chicken ramen, black garlic, nori, scallion, egg and menma (dried bamboo shoots)). There’s also an entirely vegetarian version made from mushroom dashi (Kinoko Vegetarian). Each bowl of pho and ramen can be built upon with “add-ons” and the Mecha menu gives you a few suggestions on what might be a good add-on for each particular bowl. 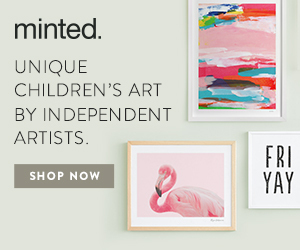 If your children aren’t into pho or pork belly just yet, no worries. Mecha is happy to serve up a plain bowl of pho or any ramen broth with just noodles or, for those meat eating minors, chicken, too. They also have plain rice and my older one loves their Red Oil Dumplings mentioned below - MINUS the red oil sauce. It’d be a darn shame to come to Mecha and only get ramen or pho. In fact, I think the BEST way to do Mecha is to go heavy on the snacks and then split a bowl or two of ramen or pho as a group. The first section of Mecha’s menu is Steamed Bao. I’ve probably had each preparation by now (and many folks swear by the pork belly bao), but my favorite is definitely the KFC Bun - Korean Fried Chicken with gochujang, pickled daikon-carrots and kewpie. It’s a “Must Order” in my book. The Snacks section is diverse and likely has something for everyone in your group - egg rolls, fried rice, spare ribs, dumplings. I believe that in the earlier days of Mecha, this section was far shorter and, honestly, we usually stick with the same snacks that have been on the menu since Day One. Specifically, we go hard on the dumplings. Mecha’s Red Oil Dumplings (pork, shrimp, sichuan vinegar and cilantro) are so satisfyingly flavorful that we get them every single visit. We similarly always order up the Roasted Mushroom Dumplings with brown butter miso and arugula. These dumplings have a rich, earthy, Umami taste and probably wouldn’t be out of place in an Italian restaurant. Another favorite in the Snacks section is the Kim Chi Fried Rice, served with chicken, scallion, bacon and a fried egg on top. This dish is large enough to share. Right now, there are also three new dishes offered on a separate Summer Snacks menu. 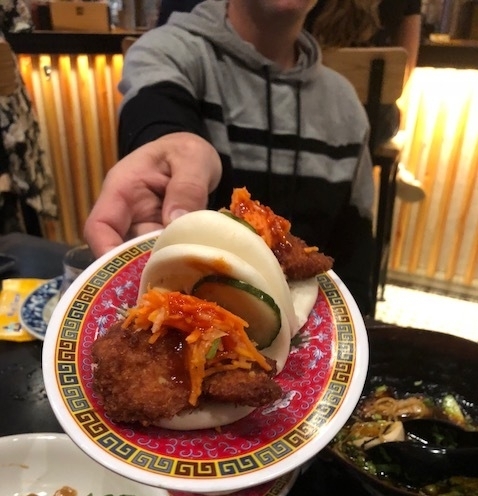 Our group ordered the Fried Green Tomato Bao and the Spicy Yuzu Hiyashi Chuka off that list. The Chuka, chilled noodles sitting in a spicy cold tsuyu broth with yuzu pork belly, avocado and cilantro, is insanely delicious. The combination of its salty soy broth and pork belly with the light, citrusy yuzu and fresh avocado is to die for. After eating most of the dish myself, I made our group order a second bowl and when I got home, I told my husband that I needed to eat it again soon….hence our return visit about a week later. Like any good restaurant, Mecha’s cocktail program is also very solid. AND, right now, that cocktail program is focused on TIKI DRINKS. 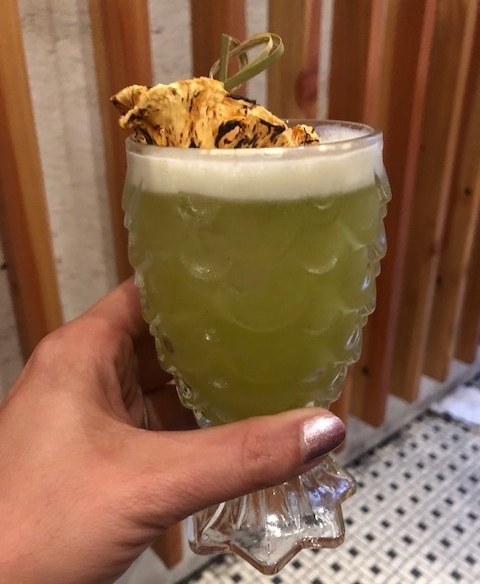 Ramen and pho don’t particularly shout out “summer,” and perhaps that’s why the Mecha team decided to unveil a brand new tiki drink menu around July 4th. Regardless of the reason, I am on board. 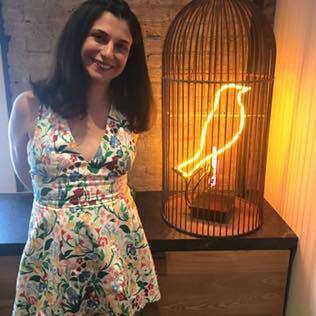 On one recent visit to the SoNo location, together with my Tiki “partner in crime”, Sarah, we tried four drinks off the new menu. In consultation with the bartender, I started with the Mat’cha Mouth (Mizu Shochu, Laphroaig Scotch, Matcha tea, coconut, lime juice and honey). It was perfectly well balanced with subtle smokey notes from the scotch. My husband opted for the Boom Shaka Laka with Jamaican rum, passion fruit, banana, Aperol, Cynar Amaro, citrus juices and torched cinnamon. He raved about the pleasant smell of the torched cinnamon every time he took a gulp. Sarah’s first drink, which I copied as my second drink, was the Do You Even Hula, Bro? This one has St. George Green Chile Vodka, pineapple, kale, ginger and lime juice. It was refreshing, easy drinking and perhaps even healthy? Then, Sarah took one for the Instagram “Team” and got the Shark Weak, which, obviously, came in a highly Instagram worthy shark glass. 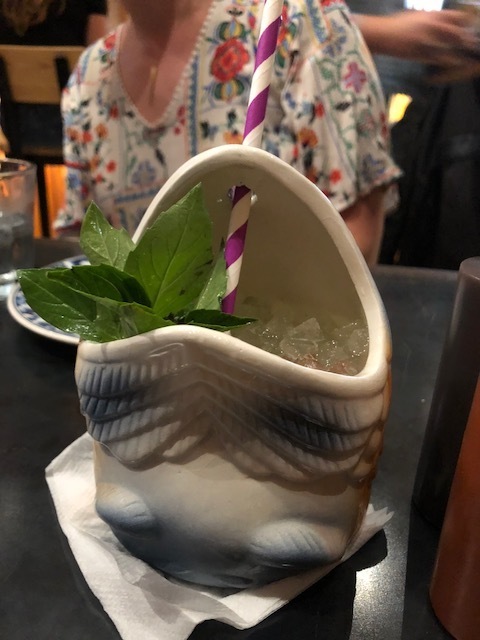 The Shark Weak is made with Avua Amburana Cachaça, Dolin Blanc, lemon juice, Thai Basil Pok Pok Vinegar and club soda. A lot was going on there. 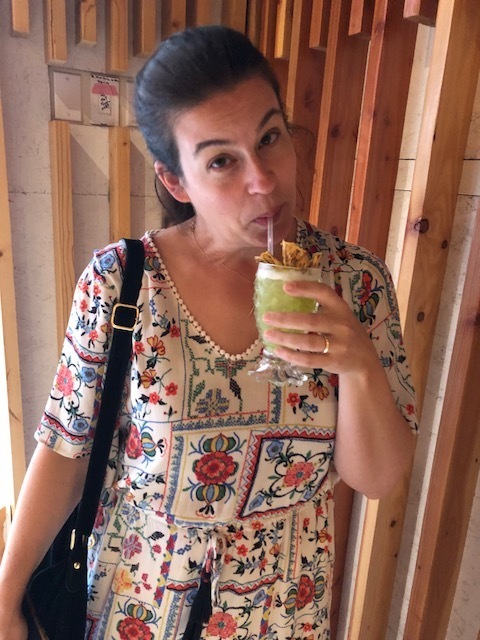 When we returned about a week later, this time with kids and other Tiki loving friends, I went back to the Mat’cha Mouth and downed it quickly. The rest of the non-children at our table got the Boom Shaka Laka. I’ll be sad when the Tiki menu goes away, but it’ll likely mean that “ramen weather” is upon again us, which will make me happy to be slurping ramen. Mecha does not take reservations and waits can be long at prime hours. Always best to plan a bit ahead, put your name down and find a nearby place to grab a drink (plenty of spots in SoNo for that) or kill some time.